i have a lot to catch you up on from the past couple of days! first, i drove down to st. louis in the sunshine this week! 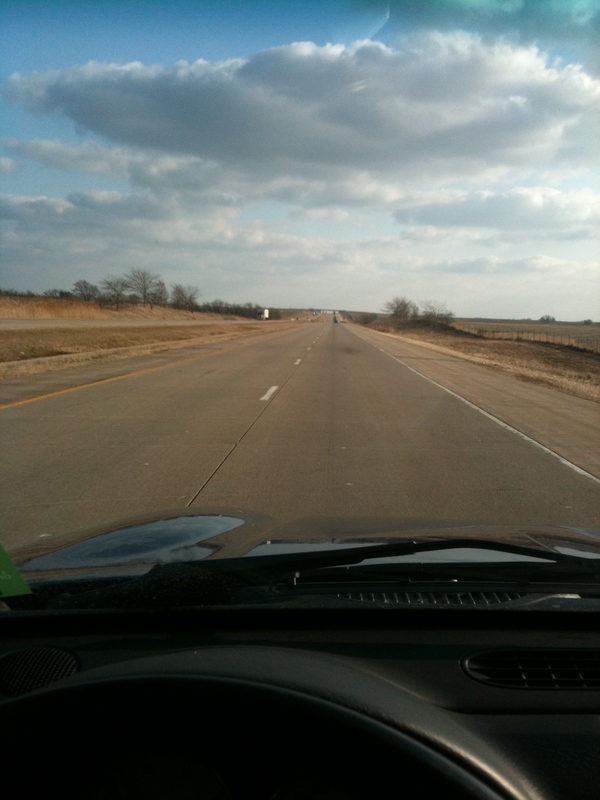 it was so refreshing to drive in nice weather – i hope it keeps up for my last few drives down. brad and i got lunch on friday at one of our favorite places to grab a quick meal near brad’s house – mcalister’s! we don’t have mcalister’s in wisconsin and brad and i both love it! 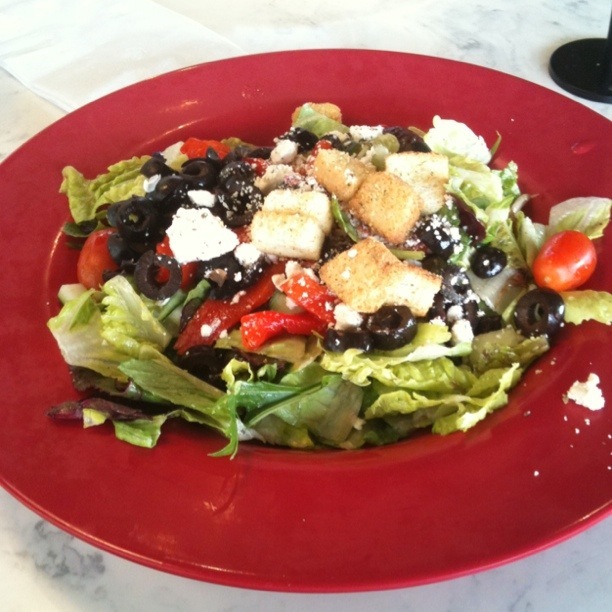 since it was a friday in lent and i was craving some veggies, i got the greek salad. it absolutely hit the spot! brad’s lutheran, so he still eats meat on fridays. he got “the big nasty”. i’m not sure what’s all in this, but i do know that brad said that this time it didn’t have as much gravy smothering it as it has had in the past… he still liked it though! 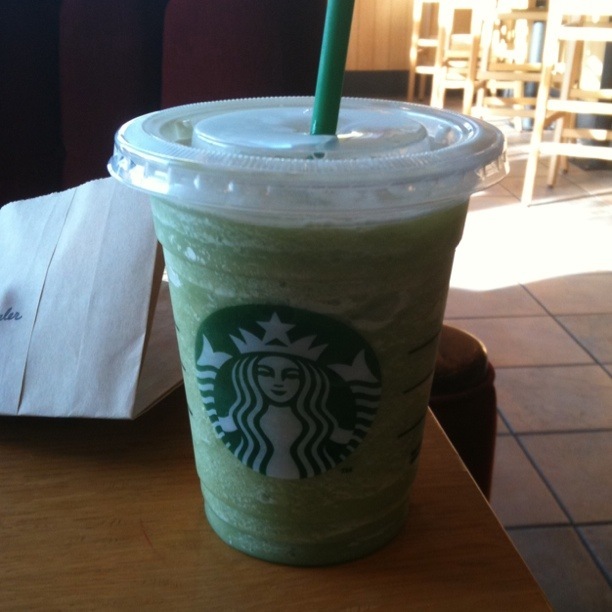 i tried a green tea frappacino! mmm….i never get frappacinos at starbucks, but this sounded absolutely perfect. i highly recommend it! i did get it with skim milk and no whip to try to make it a little better. i also got to pick a free petite treat to try! i got the salted caramel chew. friday night brad and i were invited over to dinner at his friend, justin’s and justin’s wife, dee ellen’s house! they invited brad and i and another couple over for dinner. i didn’t take any pictures, but dee ellen put on a great spread! mashed potatoes, broccoli salad, grilled asparagus, stuffing, and pork chops (which i passed on). she also made some chocolate oat chewies for dessert. i was so impressed by the meal she prepared. after dinner the 6 of us went to brunswick zone to go….BOWLING! 🙂 none of us are great bowlers, but guess who wont the second game?!? ME!! i hardly ever break 100, and i don’t think i’ve ever actually won a game, so this was pretty epic for me! ok, that was a lot to recap. 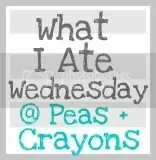 i have a delicious lunch meal out to recap from yesterday. 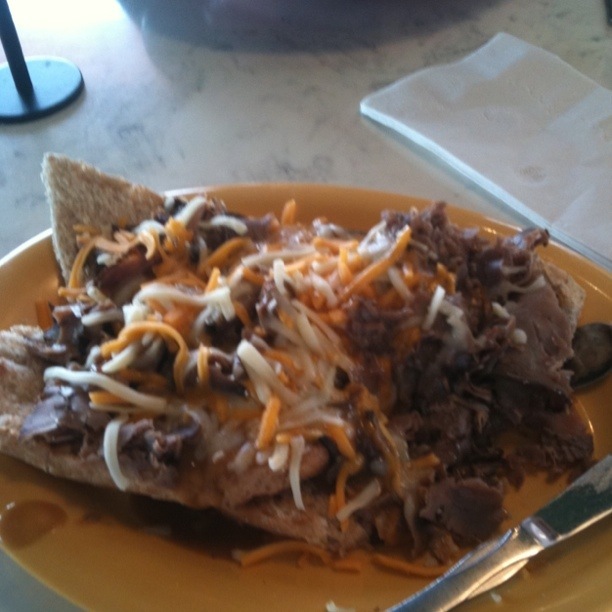 here’s a hint, we went to one of the restaurants on my st. louis list! 🙂 and then brad and i made an AMAZING dinner last night with the beef my mom sent me home with a couple weeks ago. stay tuned…..! today i have to post a photo of my favorite band or artist. well, this question is SO hard for me to answer! i absolutely go on spurts of obsession with lots of music. recent ones have included the decemberists, the raconteurs, old crow medicine show, zach brown band, and the list goes on…. 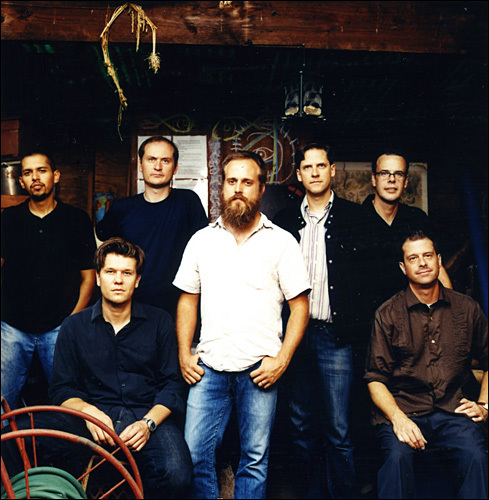 despite those recent obsessions, one favorite has stood out for a while lately, and that’s iron & wine. brad introduced me to them when we started dating and now a couple of their songs have a lot of special meaning to use. plus it’s just great music! my arbonne product giveaway is open until tomorrow night! you can enter here. also, danica is hosting a giveaway for an awesome basket including a salad spinner (that’s what i REALLY want!). go check it out here. i like all types of music! 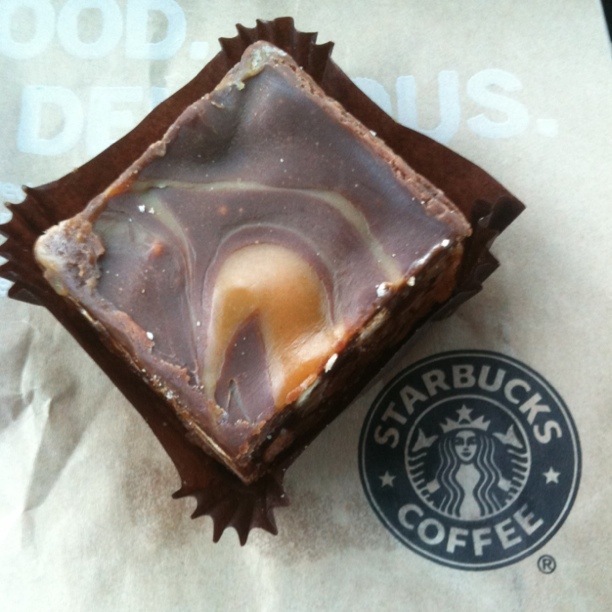 This entry was posted in st. louis and tagged caramel, chocolate, salad, starbucks. Bookmark the permalink. congrats on the bowling win!! that’s awesome. i was sooooo pumped! i just realized i forgot to put in the disclaimer that i promised brad i would share. 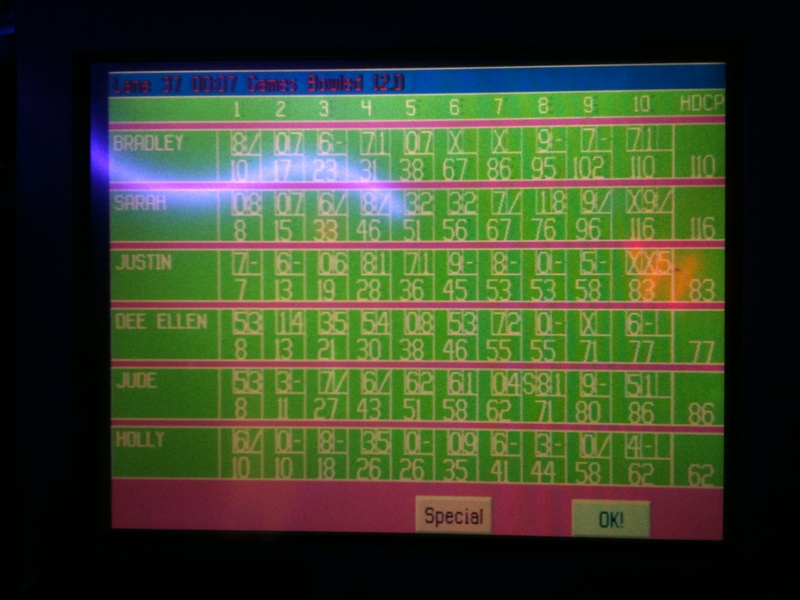 he bowled the first 3 frames left-handed, which is why i beat him….. but i don’t care! i still won! Bowling is so fun – I’m awful but it’s always good for some laughs 🙂 I have such a random taste in music…I pretty much like everything except reggae and some rap. LOVE IRON AND WINE!!!! =) so much! ok so i was really mad about springing forward til you mentioned it being lighter out later! omg yayyyyyyyy!!!!!! zac brown band is one of my country music loves! i saw them in concert and they were so cool and relaxed – it made me love them more! and i’ll give mumford & sons a try! definitely try it! i got another one today for brad and me to share – he loved it too! Wow, you sure are chipper after that long drive. I hate driving, especially longer than 2 hours. Glad you enjoyed it. The sun does make everything better. Yum, that frapaccino thingy looks really good right now! Drool! My favorite music? I’m a huge Christina Aguilera fan, even though she’s kinda lost it at the moment. I’m going to have to try that frappucino! It looks delicious! I still haven’t tried any of the petites yet. I need to get on that! the frappacino is SO good! and the petite i tried was really tasty – i don’t think i would have tried it if it wasn’t free though! That frappacino sounds SO good! 🙂 I just might need to try that soon! I got the free rocky road cake pop with my iced green tea. It was okay, a bit too sweet. I ate about half and then picked out the remaining marshmallows for my kids to eat. They don’t like chocolate (if I didn’t clearly remember birthing them both, I’d doubt they were mine, since I can live on chocolate), so all they wanted were the marshmallows. As for music, I’m either listening to kid’s music with the kids, praise music with the kids or occasional Texas country when I’m alone. oh my gosh! your children don’t like chocolate?!? i can’t imagine not loving chocolate so much that it makes me want to bathe in it…. tmi? oh well. i do like country music!! brad hates it so we don’t usually listen to it when we’re together, but when i’m alone in my car that’s usually what’s playing! that green tea frap looks YUM! I like all kinds of music, but lately I’ve been really into kinda chill music – stuff like Jack Johnson & Ben Harper. Love the smooth sounds! blah, i actually am staying in st. louis until tomorrow (wednesday) since it’s my spring break week! 🙂 so nope, i didn’t miss the snow here at all….